Greetings, I am sorry for the long delay in posting. Things have really been happening this winter regarding our lighthouses. 1. A new outboard motor was purchased by The Dauphin Island Sand Island Lighthouse Committee and the Alabama Lighthouse Association for the lighthouse tender. Peter Tanner took on the responsibility of finding the best deal and having all of the work done to the Tender. Peter did and excellent job. I will post photos of the tender here soon as I get them. 2. Thompson Engineering won a 2007 Mobile Area Chamber of Commerce , community service award in part to their efforts in helping save the areas lighthouse's. Our Congratulations to Thompson Engineering for winning this prestigious award! 3. Thompson Engineering has been working on the partial emergency repair program underway for Sand Island Lighthouse. They recently had a meeting with all the different government entities about the work planned for this summer. 4. Much work has been done recently on requesting grant moneys for the Sand Island Lighthouse stabilization project. 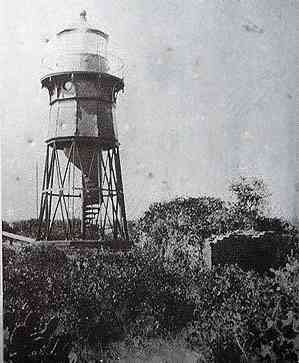 Four submissions were made on behalf of the Sand Island Lighthouse in the past week. 5. I am presently working on our Bieannual report to the National Park service on behalf of the Town of Dauphin island . As you are aware, the Alabama lighthouse Association was instrumental in obtaining ownership for the Town of Dauphin Island Alabama of the Sand Island Lighthouse. Our continued assistance of the town of Dauphin Island is part of our ongoing support of the project. That is about all I have time for right now! Enjoy the beautiful spring weather and please take time to smell the roses!